Each and every day, the important work we do demonstrates that we are leaders affecting change in our community, making it a much better place for all of us. These three words— Empower, Strengthen, Transform—describe WHAT we do as a fundraisers and WHY we do it. When you give to the Every Member Campaign you benefit both our Nova Scotia Chapter and the AFP Foundation for Philanthropy Canada. Your gift makes a profound statement of your leadership through Philanthropy and our profession. To make your gift today simply click the DONATE NOW button below. 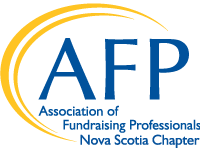 The AFP Nova Scotia Board of Directors, thanks you for your support.